The International Space Station is one of the most significant scientific achievements of our time. It was only through immense technological and political maneuvering that numerous countries around the world were able to come together to build the largest object ever flown in space. Here are 11 facts you might not know about the orbiting laboratory. 1. It’s in perpetual free fall. The ISS flies almost 250 miles above the Earth, where the planet’s gravity is still very much in force (keeping the moon in orbit, for instance). But astronauts on the ISS experience what’s called microgravity because the space station is essentially in free fall around the Earth; it doesn’t come crashing down, however, because it’s also orbiting at 17,500 miles per hour, which means it falls in perfect harmony with the curvature of the Earth. 2. It witnesses 16 sunrises and sunsets a day. Because the ISS is traveling so fast, it takes only 90 minutes to make a full revolution around the Earth. As a result, astronauts on the space station see multiple sunsets a day. 3. It boasts the largest window ever flown in space. The Cupola is the ISS’s observatory, home to the station’s best views of Earth and space. At 31.5 inches wide, the circular window at the top of the panoramic module is the biggest window to ever fly in space. It provides one of the station’s best photo ops. 4. It was only completed in 2010. While the first astronauts boarded the ISS in 2000, the facility wasn’t actually completed until a few years ago. New solar arrays, docking compartments, airlocks, and more continued to arrive after the first expedition. 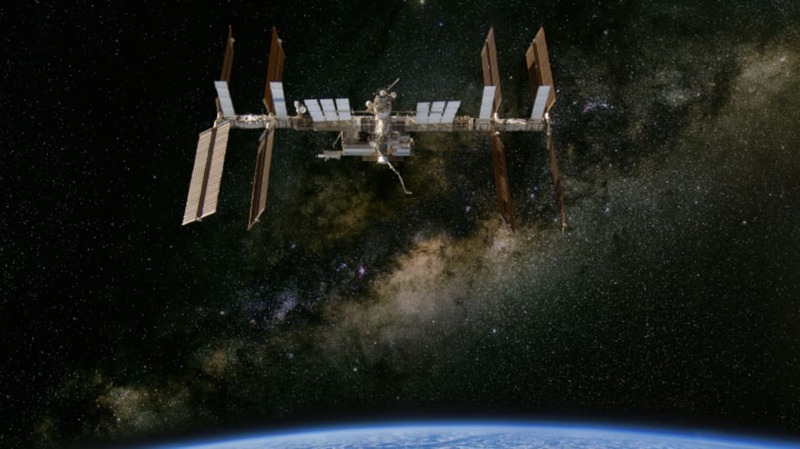 In 2009, the space station’s capacity expanded from three astronauts to six. But being complete does not mean it’s finished; new modules and equipment are still being added. 5. It’s expensive, but not as expensive as you might think. The space station cost around $100 billion to develop, build, and run. However, those costs are shared among all the nations that use the station, including the U.S., Russia, Canada, Japan, and 10 European nations. And the cost is spread out over the course of 30 years; so for Europe, for instance, the ISS’s cost is equivalent to one euro per person every year. 6. It’s the second brightest object in the night sky. Only the moon outshines it. The station is powered by more than an acre of solar panels that reflect light. That’s why you don’t need a telescope to see the ISS when it passes overhead—it appears brighter than almost anything else in the night sky. 7. It’s divided into Russian and American sections. U.S. astronauts currently fly to the space station using Russian rockets, and all American astronauts learn basic Russian. While the Russian and U.S. space agencies have generally worked in harmony with regards to sharing the space station, the ISS is basically two independent segments, one built by Russia and the other built by the U.S. and other countries, that are connected. During temporary leaks and malfunctions, astronauts occasionally have had to evacuate to the other side of the space station and close the hatch. 8. It has a greenhouse and an aquarium. Almost continuously since 2002, the Russian side of the space station has been growing plants such as sweet peas, lettuce, tomatoes, and wheat in a space greenhouse. The space station also has an aquatic habitat for breeding small fish, which scientists use as model animals to study biological systems and the impact of living in microgravity. 9. It has its own mini gym. Because astronauts don’t have to work against gravity as they move, they lose muscle and bone density while in orbit. To combat this, astronauts have to maintain a strict exercise regimen. The ISS features stationary bikes, weight-lifting machines, and several machines designed to test specific muscle groups. But the biggest challenge came with designing space-appropriate treadmills. To keep the machine’s vibrations from shaking the station, the custom treadmill is suspended inside a pit in the floor, while a harness and bungee straps keep astronauts from floating away from their workout. One astronaut likened the experience to running on the deck of a boat. 10. It’s helping us develop a Salmonella vaccine. Researchers have used microgravity to study one of the most common forms of food poisoning, the Salmonella bacteria. The changes that occur when the bacteria spend time in space are helping scientists develop pharmaceutical treatments to combat the infection. 11. It weighs almost a million pounds—or nothing at all. If the ISS were on Earth, it would weigh 925,000 pounds, the equivalent of more than 11 full semi trucks. But because it’s in free fall around the Earth (see fact No. 1) it weighs almost nothing at all. Now that you know about the International Space Station, take an in-depth look at all of the incredible technology featured on the ISS at Boeing.com.